French Spaniel is one of the oldest pointing dogs, a famous setting dog used in the Middle Ages for hunting. The French Spaniel dog breed originated in France and was used there in the 17th century. He makes an excellent companion because he is a true gentleman by nature; he has a kind, intelligent, noble, and dignified expression and friendly attitude. 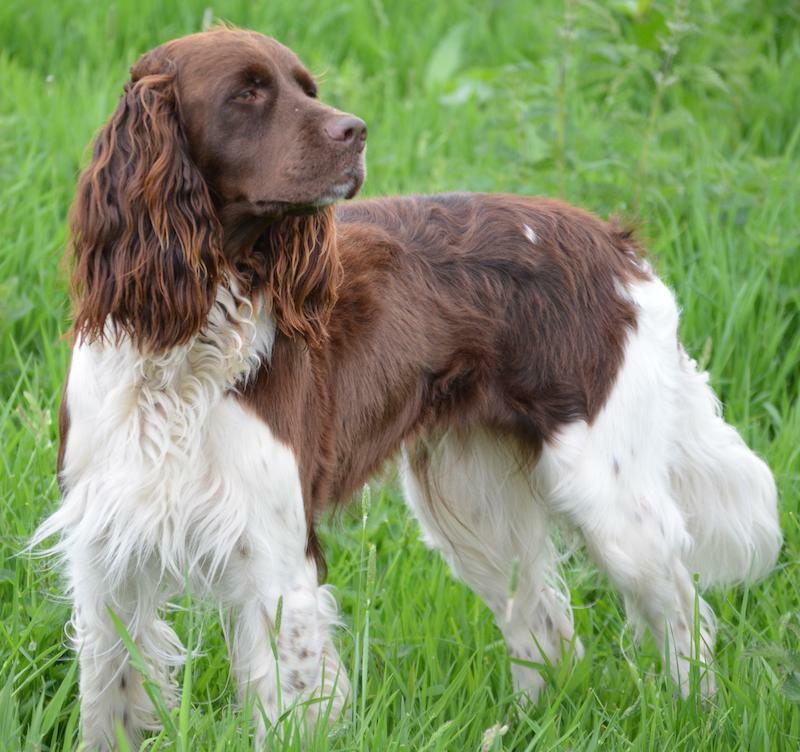 The French Spaniel is a really good hunting dog with his intelligent search, short range, accurate and quick location, pointing, style, and intensity. He makes an excellent hunting companion because of his calm nature. A good retriever works methodically on land or in water. Icy water or bramble does not deter him. 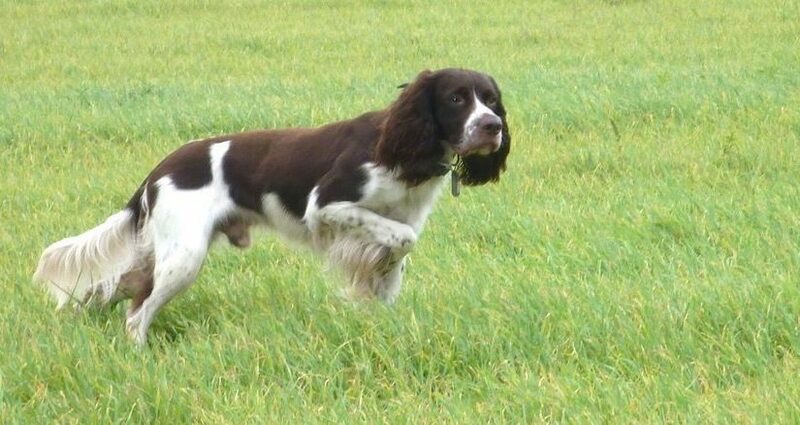 The French Spaniel has also competed in field trials, where he does very well. His intellectual, moral, and physical qualities make him an excellent sporting dog and family pet. General Appearance: The French Spaniel suggests strength and stamina, also elegance. A strongly built noble hunting dog, with great endurance, not coarse in any way, he is a medium-sized dog, very active, and lovable, mild disposition, and is never vicious. Highly intelligent in nature, his enthusiasm and willingness to work hard are his heritage. He is very easy to train. Size: Measurement at the withers: Males should measure from 22-24 inches (56-61 cm) Females should measure from 21-23 inches (53-59 cm). Coat: The hair is short on the head, front of forelegs, below the hocks, and front of rear legs. The body coat is flat (straight) or slightly wavy, medium length, sufficiently dense to be waterproof and weatherproof. The texture is fine, and the hair should have a clean, glossy, live appearance. Colour: Always white with brown markings, with or without specks. “Ticked”. Too much ticking is not to be encouraged. Head: Skull fairly long and of medium width, not quite flat. The occipital protuberance should be evident, but to a slight degree only. Cheekbones should not be prominent. Stop: midway between nose and occiput, should be well marked, but not too exaggerated. Muzzle: fairly long, broad, and deep, lips or jowls must be average thickness, slightly curved, not square as in the English Setter. Nose: well developed, brown in colour with no pale spots. The nostrils large and wide open. Eyes: medium in size, and not showing any “haw”. The colour dark amber. The yellow, light-eyed “bird of prey” eyes are a serious fault. Ears: long, framing the head, attached low, at the level of the outer corner or the eye, or lower, hanging slightly at the back of the head and not showing the inside face of the ear (burr). The ears are covered with a lot of wavy, silky hair. The tip is rounded. The hair on the ears should be brown. White fringes are a major fault. Teeth meet in a scissor bite or an even bite, neither undershot nor overshot. Neck: The neck should be of moderate length, muscular, slightly arched at the crest, and with substance in keeping with the head and body. Forequarters: The chest should be deep and fairly broad, reaching to the point of the elbows. Forelegs straight, well-boned and muscular, front feet oval shape with hard sole, well arched toes, with lots of hair between. The shoulders well laid back, shoulder blades long and well slanted. Body: Ribs well proportioned, must not be too flat, or too round. The back is of moderate length, topline slopes very slightly from the withers to the set-on of tail. The loin must be strong, short, well-developed muscles, the buttocks slightly prominent. Hind Legs: thighs broad, muscular, well-curved stifles, hocks well bent, must not be cow-hocked. Feet thick and well padded. Tail: Attached a little low, never docked, long and carried horizontally and obliquely curved slightly like an “S”. Covered with long, silky hair forming a fringe, or feathering, beginning about an inch from the root of the tail, and becoming shorter to the tip. Serious Faults: 1. Temperament: excessive timidity, or aggressiveness towards people or to other dogs. 2. Head: too coarse, too short a muzzle, too much or too little stop, lips too thick or too square. 3. Nose with pale spot, small or dry nostrils. 4. Eyes not of the prescribed colour, too light, too deep set, or too prominent. 5. White hair around eyes. 6. Ears too short, set on too high, or having white feathering on them. 7. Elbows turning in or out. 8. Chest too shallow. 9. Ribs too flat or too barreled. 10. Flat or long feet. 11. Tail set too high or carried between the legs. 12. Coat incorrect texture and density, hair too short, or too wavy. 13. Insufficient feathering on neck, chest, legs and tail. 14. Colour brown too light or too dark. 15. Head all white or all brown. 16. Body all brown. Disqualifications Males over 25 inches (64 cm) or under 22 inches (56 cm). Females over 24 inches (61 cm) or under 21 inches (53 cm). Teeth undershot or overshot more than 1/16th of an inch (.158 cm).